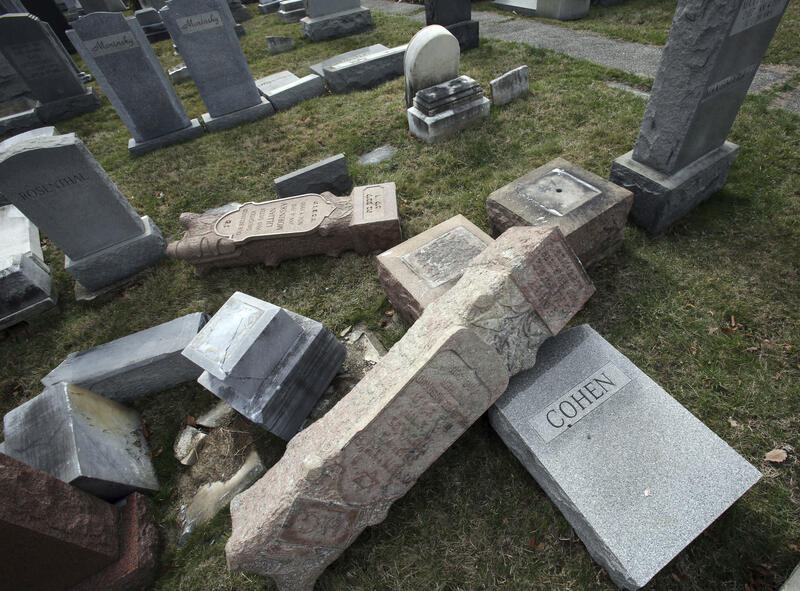 Jewish centers and schools across the nation coped with another wave of bomb threats Monday as officials in Philadelphia made plans to repair and restore hundreds of vandalized headstones at a Jewish cemetery. Jewish Community Centers and day schools in at least a dozen states received threats, according to the JCC Association of North America. No bombs were found. All 21 buildings -- 13 community centers and eight schools -- were cleared by Monday afternoon and had resumed normal operations, the association said. It was the fifth round of bomb threats against Jewish institutions since January, prompting outrage and exasperation among Jewish leaders as well as calls for an aggressive federal response to put a stop to it. In Cherry Hill, New Jersey, a Jewish Community Center was evacuated Monday morning after a threatening call, CBS News’ Jeff Pegues reported. Since the beginning of the year, there have been at least 90 similar phone calls across 30 states and one Canadian province. A U.S. official says the calls appear to be coordinated. Some may be originating from overseas. They range from individuals phoning in threats to machine-generated or altered calls. The phone threats have targeted Jewish Community Centers in waves from East to West coast. They usually come around late morning when centers are in full use, Pegues reported. The FBI and the Justice Department’s Civil Rights Division are probing the threats. “We are a nation that is a diverse constituency, and we don’t need these kind of activities,” Sessions said. In Philadelphia, police investigated what they called an “abominable crime” after several hundred headstones were damaged during the weekend at Mount Carmel Cemetery, a Jewish cemetery dating to the late 1800s, said Steven Rosenberg, chief marketing officer of the Jewish Federation of Greater Philadelphia. “I’m hoping it was maybe just some drunk kids,” said Aaron Mallin, who discovered the damage during a visit to his father’s grave. “But the fact that there’s so many, it leads one to think it could have been targeted,” he told WPVI-TV. Following the vandalism, nearly 200 interfaith leaders from several religions gathered at the Lutheran Seminary in the Germantown section of Philadelphia to stand in solidarity, CBS Philly reported. People from all backgrounds have stood up in solidarity, including some in the Muslim community like Salaam Bahatti, who said his community knows what it is like to be targeted. “Any targeting of any faith is an attack on all faiths ... If they come for the Jews they will come for us soon enough,” Bahatti said. The vandalism came less than a week after a Jewish cemetery in suburban St. Louis was targeted. More than 150 headstones there were damaged, many of them tipped over. Both acts of vandalism spurred offers of help. The Philadelphia Building & Construction Trades Council, an umbrella group for more than 50 union locals that work in the construction industry, offered to repair the damage at Mount Carmel free of charge, calling it a “cowardly act of anti-Semitism that cannot be tolerated.” A community cleanup organized by the Jewish Federation was to begin Tuesday with as many as 50 volunteers per hour. And in Missouri, a Muslim crowdfunding effort to support the vandalized Jewish cemetery near St. Louis had raised more than $136,000 by Monday, with organizers announcing they would use some of the money for the Philadelphia cemetery. Monday’s bomb threats caused no physical damage but were no less worrisome. Some 200 people were evacuated from a Jewish Community Center in York, Pennsylvania, after a caller told the front desk there was a bomb in the building, said Melissa Plotkin, the York JCC’s director of community engagement and diversity. Police entered the building and cleared it, she said. Pennsylvania Gov. Tom Wolf, who has long ties to the York center, having served on its board, called the bomb threats and cemetery vandalism reprehensible. Jewish centers and schools in Alabama, Delaware, Florida, Indiana, Maryland, Michigan, New Jersey, New York, North Carolina, Rhode Island and Virginia also were threatened, according to the JCC Association of North America. Paul Goldenberg, director of the Secure Community Network, a nonprofit founded by several national Jewish groups to bolster security in the Jewish community, said Jewish Community Centers and other Jewish institutions have extensive security protocols in place.